Darkest Sins: The Forever Girl Tour: Character Interview & Giveaway! The Forever Girl Tour: Character Interview & Giveaway! This is the last stop for The Forever Girl Tour (by Dark Mind Book Tours)! Welcome to Darkest Sins, Rebecca! 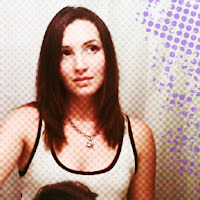 Rebecca Hamilton writes Paranormal Fantasy, Horror, and Literary Fiction. She lives in Florida with her husband and three kids, along with multiple writing personalities that range from morbid to literary. She enjoys dancing with her kids to television show theme songs and would love the beach if it weren’t for the sand. Having a child diagnosed with autism has inspired her to illuminate the world through the eyes of characters who see things differently. To learn more about Autism Spectrum Disorder, please visit this website. For those who don't know about the book, I invite you to check my review, while here you can read the book summary: Sophia Parsons’ family has skeletons, but they aren’t in their graves... Solving the mystery of an ancestor’s hanging might silence the clashing whispers in Sophia's mind, but the cult in her town and the supernaturals who secretly reside there are determined to silence her first. As Sophia unknowingly crosses the line into an elemental world full of vampire-like creatures, shapeshifters, and supernatural grim reapers, she meets Charles, a man who becomes both lover and ally. But can she trust him? It’s not until someone nearly kills Sophia that she realizes the only way to unveil the source of her family's curse: abandon her faith or abandon her humanity. If she wants to survive, she must accept her who she is, perform dark magic, and fight to the death for her freedom. • Silvia (already blushing): Charles, welcome to Darkest Sins! Would you like to introduce yourself to this amazing audience? Charles (laughing): My, Silvia. You look flushed! Hot day today? (to amazing audience, waves his hand) Hey, I'm Charles. • Silvia (embarrassed): Yeah, you're- *cough* It's kinda HOT. (focus, Silvia, focus!) So, how are things going with Sophia? Charles (grasping Sophia's hand): Wonderful. (looking to Sophia) Really wonderful. Sophia (smiling at Charles, then Silvia): Things have been great, Silvia. We've been preparing for everything that lies ahead of us, and while some of those things are frightening, Charles has been strong through it all and that has helped with my faith and confidence. Charles (terrified, but not letting it show): No use living in fear of the things you cannot escape. We'll get through it. My relationship with Sophia has taught me that life is less about what happens and more about what you do about it and who you do it with. • Silvia (smirking): Like stalking each other? Sophia: Hey, you would have thought so, too! He kept showing up everywhere I went. Charles (to Sophia): You mean you kept showing up everywhere I already was. Sophia: Well, I didn't know you were there. Charles (leaning closer to Sophia to whisper while patting her knee): Sure thing, darlin'. Whatever you say. Sophia (clears her throat): I think Silvia's trying to ask you another question. • Silvia (winking to Sophia): Charles, I'm curious, do you have any favourite shapeshifting form? Charles: An owl. I enjoy flight, and it's a form that doesn't draw suspicion. There's also a comfort in the illegality of hunting birds of prey. • Silvia: You've been around for a while so, I suppose you could tell me a decade you particularly loved as well? Charles: Hard to choose. I've experienced many the rise and fall of many great and horrible things over the years. If I had to choose, perhaps I would say the 1960s in America. It was great to see people standing up for equality, something my world still battles with today. Many died for the cause. That time remains an inspiration to me. • Silvia: Ok, you earned an easy question, one that I know you're anxiously waiting for... (grinning) What drives you crazy about Sophia? Charles (cupping hands over Sophia's ears): She snores! Charles (laughing): Really, it's so many things. Her sense of humor, the way she always stands up for what she believes in. Most of all, though, it's her persistence that drives me crazy. You could say I have a love/hate relationship with her persistence. But I have to admit, sometimes I could kick myself for not listening to her. Sophia: See! You should listen to me more often. Sophia (giving Silvia a knowing look): Poor guy. He's so conflicted. It's like there's two sides to him. Charles: There is two sides to me! Sophia (to Silvia, smiling): Well, at least you sort of got a straight answer out of him. Sophia (high fives back, laughing). Charles: I was there first! (laughs). Sophia, on the other hand, seems to daydream about people watching her sleep. Sophia: Uh, no! And take today for example. I definitely got to this interview first, and then YOU showed up. Charles: Nice try. I was holding the door for you, princess. Sophia: But I reached the door first, remember? You had to reach around me to open the door. Charles: Forgive me for not being in a rush every where we go. Sophia: You're forgiven. (grins) (To Silvia): I think he secretly likes it when I give him a hard time. • Silvia (laughing): Definitely! (smiling at Charles) Now come on Charles, surprise us all with a lovely, spontaneous (grins) compliment to Sophia! Sophia: Dr. Evil got to that one first. Try again. Charles: I guess "I like your eyes" is out of the question, too? Charles: There's no one like you. Sophia: Scorpions beat you to it. Charles: Silvia said to compliment you; she didn't say I had to be original. Now it's not spontaneous anymore. (frowns). You're lucky you're cute. Sophia (grins): There you go! Now just tell me you love me for my mind and we'll be good to go! • Silvia (trying to be casual): Okeeeey. My bad, I should concentrate on Charles. (don't go there, don't go there..) Not that I don't. (oh-oh, awkward moment) I mean, of course I think about you, Charles. (danger, DANGER!!) I didn't mea-... You know what? Let's talk about Adrian. You two seem very close, how would you describe your friendship with him? Charles: Adrian is my right hand man. I trust him with my life and see him as I would a brother. Charles: Silvia, you are shameless (smiles). There's always room for more friends. • Silvia (smiling and blushing): Trust me, I am not... (blushing harder) But to recall my blog title, (smirks) do you have any darkest sins to share, Charles? Charles: I've already shared many of my transgressions with Sophia, but there is one I share with Sophia. We both lie by avoidance. If I don't want to share the truth, I will usually find another related truth to share that steps around the question itself. I've caught Sophia doing the same. Sophia: Sometimes the truth hurts, and I don't want to hurt anyone. Charles: Right. (looks at Sophia) And sometimes we don't want to hurt ourselves. Self-preservation can lead people to do all kinds of things they'd wish they hadn't. (Shifts a very serious gaze to Silvia.) How far do you think a sin can go before it can no longer be forgiven? Charles: We are. (smiles at Sophia). Sophia's presence has given my life new meaning and purpose. I feel more alive with her than I have in centuries. Charles: Actually, I'm quite a bit older than you. (grins) Thank you for inviting us, and I hope your birthday is wonderful. 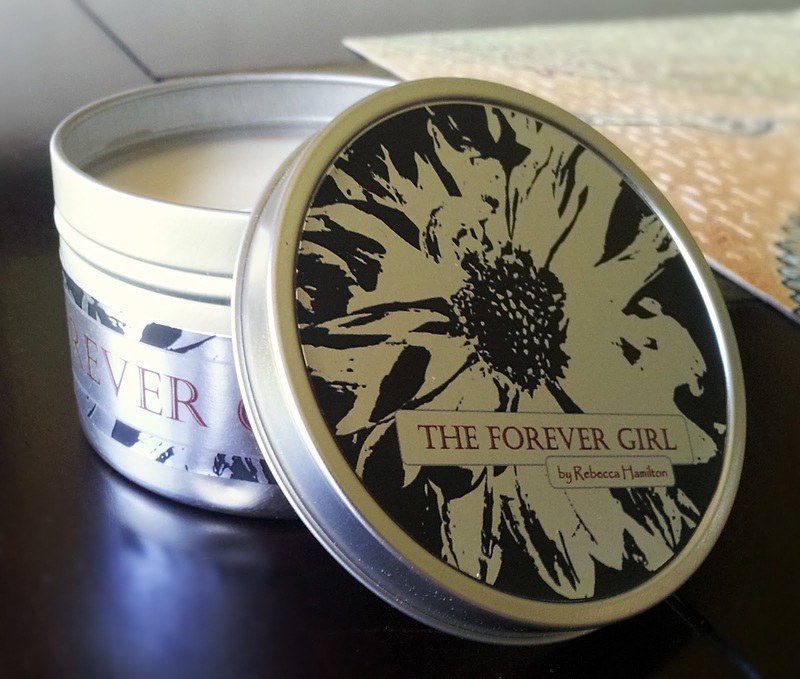 Rebecca is giving away an ebook copy of The Forever Girl and the lovely scented candle you can see in the picture on the left!! The ebook part is International, but I'm afraid the candle is for US residents ONLY. 2. Leave a comment with your email address, the country you live in and the answer to this question: What was your favourite part of the interview?